A new study from SurveyMonkey Intelligence revealed the 30 most-downloaded and most-used apps in the American iOS and Android app stores so far this year. Social media apps like Facebook, Snapchat and Instagram ruled over mobile games in the first six months of 2016. Music apps made a strong showing, ranging from expected entrants like Pandora and Spotify to newer entrants Musical.ly. As well-intentioned as their developers may be, health and fitness apps didn’t crack the top 30 in either most-downloaded or most-used rankings. 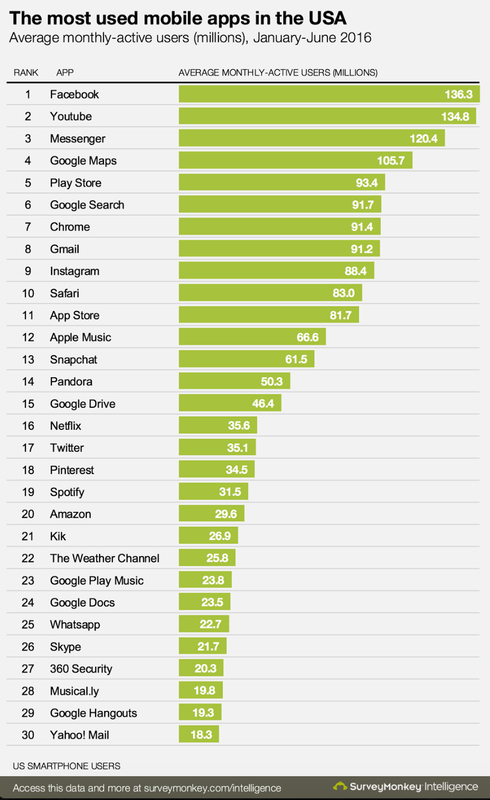 The report found that, as is typical, the most-downloaded apps are not the most used. The top five most-downloaded apps were Messenger, Snapchat, Facebook, Instagram and Color Switch, whereas the top five most-used apps were Facebook, YouTube, Messenger, Google Maps and Play Store. 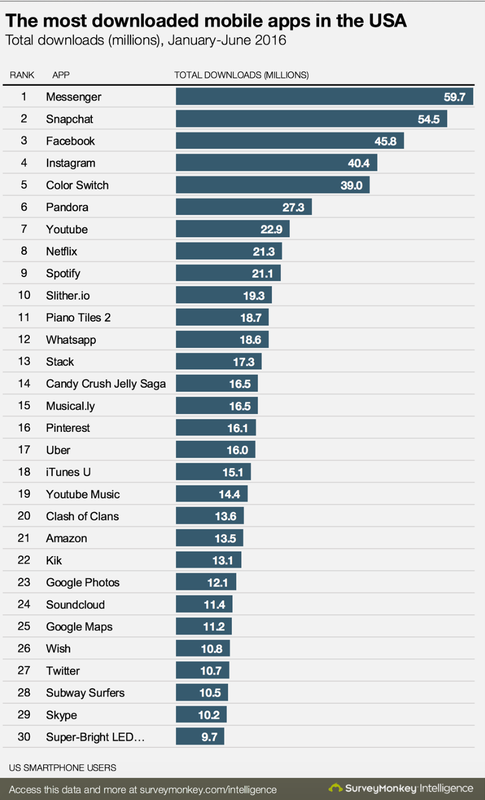 To find something that isn’t owned by either Facebook, Apple or Google on the most-used app list, you need to go down to the 13th slot where Snapchat is ranked. “Fully 40 percent of the most-used apps come pre-loaded on the operating system, highlighting the importance of Android and iOS to Google and Apple, and giving some insight into Facebook’s ongoing desire to control this deeper layer of the stack,” the report said.